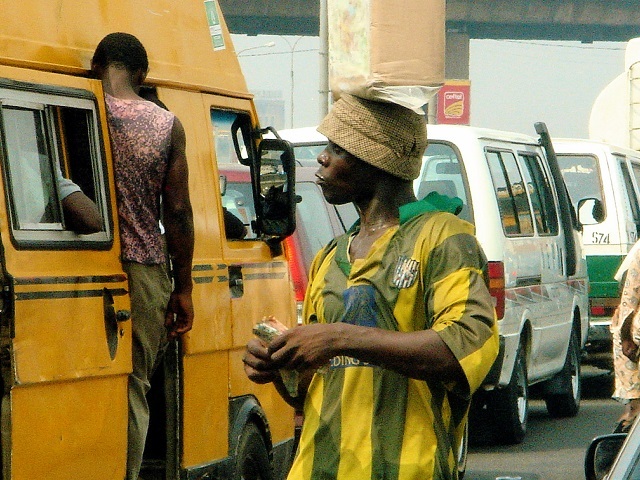 What does the future of sustainable transport look like in Lagos? Lagos struggles with congestion and insufficient mass transit, but a recent focus on sustainable transport can improve mobility and reduce greenhouse gas emissions. Photo by G@tto Giallo/Flickr. Lagos – the largest city and commercial capital of Nigeria – has traditionally struggled with a lack of reliable mass transit systems and severe traffic congestion. The average Lagos commuter spends over three hours in traffic every day. More recently, however, the city has made strides to improve mass transit options. In 2008, Lagos introduced Africa’s first bus rapid transit (BRT) system modeled on its South American counterparts in cities like Curitiba, Bogotá, and Santiago. Lagos is also pursuing sustainable transport options such as light rail, ferry, and cable car. These transport options are part of the city’s efforts to reduce its environmental impact and improve climate resilience. While Lagos still has significant room to improve mobility, its multimodal approach to transport investments holds great promise for the city’s commuters. In 2006, the city and state government adopted the Strategic Transport Master Plan with the goal of delivering an integrated public transit system within two decades. In accordance with this plan, Lagos became the first city in Africa to implement a BRT system in 2008. Though the system does not use all the features of some BRT systems, it still has many advantages over a traditional bus system. For example, the Lagos Metropolitan Transport Authority (LAMATA) dedicated a special lane for BRT buses along 65% of the Mile 12-Ikorodu Road corridor to reduce travel time from mainland suburbs to the central business district on Lagos Island. This BRT service has had a significant impact on transport in Lagos, and already has daily ridership of 200,000 people. Despite accounting for 25% of commuters, the BRT system contributes only 4% of all traffic. Further, the system was constructed at the relatively low cost of USD$ 1.7 million per kilometer. In comparison, Bogotá’s TransMilenio cost about USD$ 6 million per kilometer. Lagos is building on its BRT system with investments in a range of other sustainable transport options. In a speech at last month’s Mail & Guardian conference on urban migration and renewal, Lagos Governor Babatunde Raji Fashola outlined six areas of infrastructural investment in mass transit. These included a light rail project called “Eko Rail,” a suspended cable car system, and improvements to the existing ferry system. Investments in the ferry system aim to address Lagos’ underutilization of water as a means of transport. The ferry system currently only carries about 18,000 people, even though about one fifth of the city is made up of water in the form of lagoons, creeks and the Atlantic Ocean. Three new jetties will supplement the existing ferry infrastructure. The cable car system, meanwhile, aims to be an affordable means of transport that can reduce average journey times by up to 70 minutes each direction. The addition of Eko Rail could further ease traffic congestion and help meet the rising demand for affordable mass transit in the metropolis. The Blue Line, which is the first of seven rail lines in the network, will be operational in 2016. Eko Rail plans to offer through-tickets for buses and will encourage transit-oriented development (TOD) around stations. When operational, Eko Rail will have the capacity to capture up to seven times as many passengers daily as the BRT system. Integration between multiple transport solutions will offer Lagosians a greater variety of mass transit options, and will improve quality of life and the ease of doing business in the city. Investments in sustainable transport are an important part of mitigating climate change. At the annual Lagos Climate Change Summit (LCCS), organized by the state government to address vulnerabilities associated with climate and environmental change, participants discussed strategies to finance sustainable transport projects such as public-private financing frameworks and financial intermediaries. For example, Lagos is partnering with the African Development Bank, which is providing a USD$ 60 million loan for the Lagos Cable Transit System and is advising the application of carbon credits from the United Nations Framework Convention on Climate Change (UNFCCC). Improving sustainable transport options could have a significant impact on helping Lagos minimize its climate impact. The deployment of BRT, for example, has contributed to reducing carbon dioxide emissions from urban transport by 13%. Meanwhile, the light rail system will be powered by a 25MW gas-thermal power station. It will also use electric-powered cars to ensure cleaner operation. Despite Lagos’ efforts, continued improvements are necessary. Recent studies suggest that mass transit schemes like BRT systems and light rail networks alone do not necessarily reduce overall car traffic when there is high demand for road space. To reduce congestion, expanding transport options may need to be complemented by other initiatives like congestion pricing to discourage the use of cars and a shift towards compact, mixed-use development.